When they don’t want visible socks to ruin the look of their trainers or shoes, what better way to make sure kids’ feet stay fresher and more protected than Falke Invisible Step Shoe Liners? 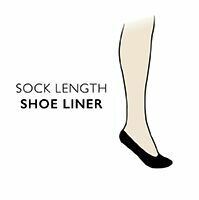 The stretchy cotton foot socks are woven to have a perfect fit, with smooth seams and are shaped to be near-invisible when worn in shoes. Falke Invisible Step Shoe Liners have reinforced toes for durability and a series of silicone strips, forming an anti-slip system around the heel to keep the liners comfortably in place.